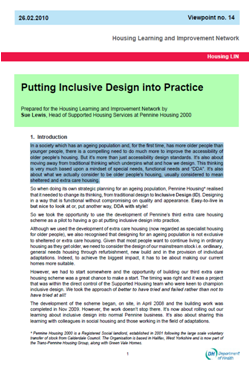 In a society which has an ageing population and, for the first time, has more older people than younger people, there is a compelling need to do much more to improve the accessibility of older people’s housing. But it’s more than just accessibility design standards. It’s also about moving away from traditional thinking which underpins what and how we design. This thinking is very much based upon a mindset of special needs, functional needs and foundations of the “DDA”. It’s also about what we actually consider to be older people’s housing, usually considered to mean sheltered and extra care housing.